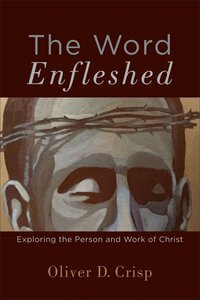 About "The Word Enfleshed: Exploring the Person and Work of Christ"
Oliver D. Crisp (Ph.D., King's College, University of London) is Lecturer in Theology at the University of Bristol. Crisp is an evangelical philosophical theologian who completed his doctoral studies under Paul Helm. Previously, he taught at the University of St. Andrews in Scotland (2002-2004), and held the Frederick J. Crosson Research Fellowship in the Center for Philosophy of Religion, University of Notre Dame, USA (2004-2005). He was visiting lecturer at Regent College, Vancouver lecturing on Christology. Two volumes on Christology; Divinity and Humanity: the Incarnation Reconsidered (Cambridge, 2007) and God Incarnate: Explorations in Christology(T & T Clark, 2009). Forthcoming works include An Essay on Original Sin (Oxford University Press, 2010); Analytic Theology, edited with Michael Rea (Oxford University Press, 2008); A Reader in Contemporary Philosophical Theology (Continuum, 2008); Retrieving Dogmatics: Essays in Reformed Theology (Paternoster, 2010) and Helm on Philosophy of Religion: Collected Essays of Paul Helm (Ashgate, 2010).